How Much Will Clarington Property Assessments Rise in 2017? Clarington residential property assessments have been a hot topic lately, as the values of Clarington real estate have risen sharply in the last few years. 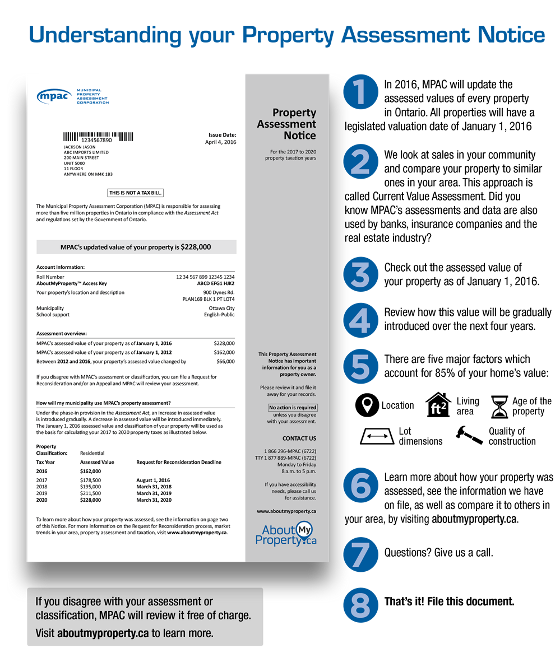 The Municipal Property Assessment Corporation (MPAC) has released projections for 2017, and Clarington assessments will be rising at an average rate of approximately 7.4% in 2017. The map above shows the city broken down into districts and indicates how each one will change in 2017. Will Taxes Go Up 7.4%? Many people are mistakenly under the impression that if their assessment goes up 7.4%, then their taxes will go up 7.4%. That is simply not true. The municipal tax rate (or millage rate) will be adjusted to make the average property tax increase zero before the city's budget increase is taken into account. If your assessment goes up more than the 7.4% average, then you will see an increase in your taxes due to the assessment. If your assessment goes up less than the average, you will see a decrease.